Lichthaus Arnsberg presents the solo exhibition “Out of Shape” by Mirjam Thomann. For the exhibition at Lichthaus Arnsberg, Mirjam Thomann, quite literally, gave her work a fresh coat of paint. As the starting point of her modifications was the question: What happens to a work when being removed from its architectural and institutional contexts and relocated to another setting? In a methodical approach on site at the Lichthaus Arnsberg, Thomann has developed an altered version of the installation first shown at her 2009 exhibition at the Casco Office for Art, Design and Theory in Utrecht, Netherlands. “Shapes, Dimensions, Possibilities” (2009) was the original title of the project. This work had a dual relationship to the location of the initial exhibition. On the one hand a spatial structure created out of painted timber beams – a permanent installation, serving as multi-functional exhibition architecture – was extended through to the exterior of the building. On the other hand Thomann transferred anamorphic forms from photographs of the Rietveld Schröder House, located in close proximity to the Casco exhibition space, on to the timber beam grid. The turnable distorted shapes reference the iconic photographs of one of the most frequently reproduced modernist structures in the world. According to the historical model the surfaces were, as determined by the De Stijl movement – to which architect Rietveld belonged – painted in the distinctive primary colors: red, yellow and blue. 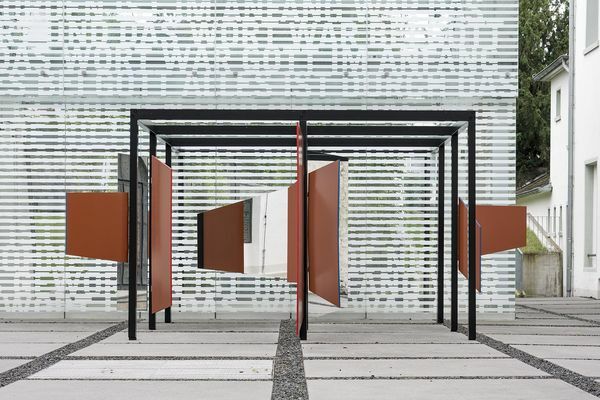 For “Out of Shape” Thomann converted her original installation for Lichthaus Arnsberg – a post-modern building in the midst of a historic monastery, constructed out of glass and concrete with attached landscaped grounds. As a temporary extension affixed to the glass façade of Lichthaus Arnsberg, “Out of Shape” reaches to the outside of the building. The majority of the installation is translocated to the publicly accessible monastery, resulting in the continuous dissolution of interior and exterior boundaries. With a clear passion for deconstructive processes and re-contextualization, Thomann painted over the red, yellow and blue surfaces of her original installation with a brown, formulated by mixing all of these colors. Nevertheless, at the edges hints of the first coats of paint are still visible. The asymmetrical shapes are partially mirrored and can be moved on hinges. The spatial model allows visitors to actively alter the work, constantly transforming the relationship of the brown surfaces to their environment. Mirjam Thomann was born in 1978 in Wuppertal. She studied at Kingston University of London and the University of Fine Arts in Hamburg and now lives in Berlin.